Shared suppers and neighbours like cousins: communal living in Cochin, Sask. Initially, the Sanford-Becks' new lifestyle was supposed to last a year. They were interested in what it would be like for their family to live in a rural setting. Though they were nervous about living off the land, and aware of all the farming skills they didn't have. The Sanford-Beck family visited for the vegetables and stayed for the lifestyle. When Janice Sanford-Beck and her husband Shawn pulled up to a farm in Cochin, Sask. they were just looking to purchase some fresh vegetables. What they found at the farm enticed them to stay—​and it wasn't the vegetables. Several families were living on the farm communally. "The fact that they were living so close to the land attracted me," said Janice Sanford-Beck. "They happened to have a vacant home on their land." The Saskatoon couple packed up their three children, rented out their home, and headed to Cochin. Initially, the Sanford-Becks' new lifestyle was supposed to last a year. They were interested in what it would be like for their family to live in a rural setting. Though they were nervous about living off the land, and aware of all the farming skills they didn't have. The idea was for Janice to work with the owner of the farm on the commercial gardens on the property. The family would live in a house on the farm, surrounded by neighbours. "'Neighbours' is the word we use, but it's obviously a closer relationship than many people have," said Janice. The families work the land together and live mostly off the livestock they raise and the vegetables they produce. They frequently share meals together and conduct a bible study group every week. Every month, the neighbours gather with others who live in the area for a full moon ceremony. 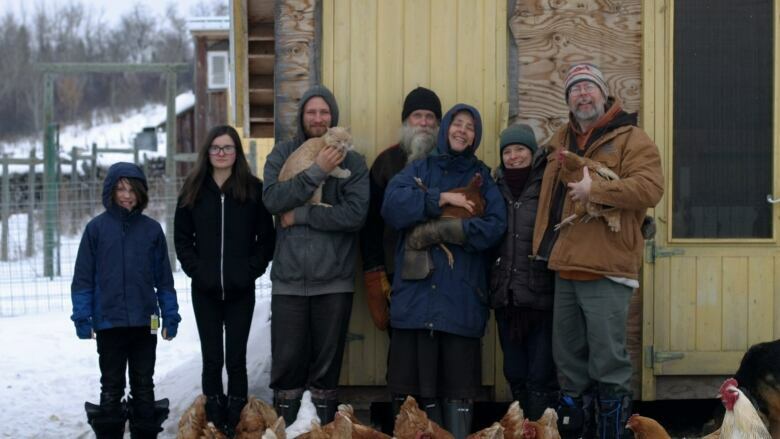 "At one time we did have a shared supper once a week with our farm meeting following it," said Janice, but that got to be too cumbersome due to each family's schedule. The Sanford- Beck family: Christopher (foreground) Robin, Janice, Shawn, and Rowan (back row, left to right) (Submitted/ Janice Sanford-Beck)Sanford-Beck says her children are warming to the lifestyle, too. Their neighbours are more than friends and "it's like having cousins around," she said. "It's nice for them to have this group of people closer to their age close by, and to be able to interact with them on a daily basis." The Sanford-Beck children are 18, 13, and 10. They're home schooled, which fits well with the family's lifestyle. It was difficult, though, for the family's young daughter to adjust. "The animals here actually helped her along the way," said Sanford-Beck. The girl bonded with a puppy the family adopted from the local farm dog, plus a few kittens. Their eldest son is in Victoria pursuing studies, but has built a tiny home on the property. His only complaint was missing the socialization of high school in his final year. For Sanford-Beck herself, the transition was easy. "It's a bit like a fish coming to water. I always loved to play pioneer as a child and was really interested in Indigenous peoples' traditional lifestyles." There are lessons to be learned, though, beyond working the land and harvesting livestock. Living in close proximity to other families has given the Sanford-Becks some perspective. Janice has learned "to step back and really dig into where that perspective is coming from" in confrontations. "I'm still learning," she said. The family sold their home recently and plan to stay on the farm. "It's as permanent I guess as anything is in this life. We're here for the foreseeable future," said Sanford-Beck.